tutorial | Apple pie, anyone? So, I told the Boy I wanted to make the kids a permanent fort… enough of this dragging chairs and bed linens and pillows from near and far every. single. day. only to be abandoned 15 minutes later. NO MORE, I say. Mamma is tired. I told him I wanted 4 poles and a canvas drop cloth. I told him I would attach the canvas with fabric ties. I told him it could be done for less than $100 and I told him not to get all CURTIS JAMES COMPLICATED on me. I’d say we did fairly well. 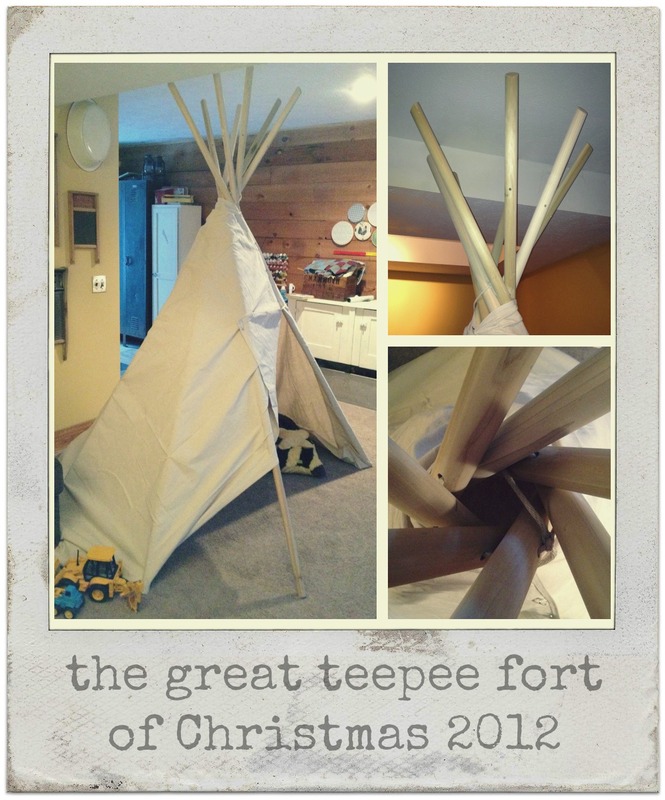 Ladies and (a few) Gentlemen, I present to you the Great TeePee Project of Christmas 2012. Or, in our house, the PEE-TEE. Ry has a tendency to reverse syllables. It’s endearing. This is really simple, Folks. Drill a hole through each of your poles 24-inches down. Lay your poles flat and thread the small length of ropes through the holes. Connect Pole 1 and Pole 7 (or whatever your first and last poles are) to make a complete circle. This doesn’t need to be wicked tight… a little give in the ropes will allow you to even out the structure easier. The trickiest part is setting up the structure. Man-handling 8.5′ poles is easiest with 2 people. Just stand them up and scissor them… 4 to the left and 3 to the right… so you nearly have a large X. Now fan each pole out, in order, around the circle until you have you have the spacing even and you’re happy with the placement. Now, throw your canvas around the teepee frame just under the rope. We have ours secured with safety pins for now, and it’s lovely, but you could certainly use heavy-duty velcro or fabric ties. We do not have the tarp secured at the bottom of the poles. We found it’s really not necessary. I’ve not trimmed the tarp or made it completely circular. For now, the rustic-simple-no fuss method is working for us. There ARE holes at the bottom of the poles. These are for connecting the poles at the base and making it so they don’t shift when little feet kick at them or slide down them or rearrange them. A rope or wire through the bottom poles will make it a more rigid structure. BUT, we’ve not done that either… the 7 poles are super sturdy and, so far, Gideon-Proof (which is saying something). he sanded the poles a bit because it looks nice… AND, he knew it was a safe bet Gus Man would attempt to slide down the poles like a fireman. he made 2 sets of holes at the top of each pole… one at 12″ and another at 24″. This allows us to make the teepee bigger if we move it outside where ceilings are not an issue. In the spring, I’ll fit the canvas tarp a bit more and remove the safety pins. Maybe we’ll paint on it, maybe we won’t. As it stands now, with the rope attached at 24″ from the top of the poles, you have a 6-foot diameter footprint that is 5.5′ tall INSIDE at center and 7.5′ tall from base to tip on the OUTSIDE. We can fit our entire family inside… and have, multiple times… with pillows and blankets for movie night. It’s a hit. A $75 hit. And it may be the biggest present they ever receive. Literally. What was your biggest present as a kid? I’s sick. Fever, chills, achy eyelids sick. Ry’s not far behind me and Gideon is just as happy as can be thelittlebugger. 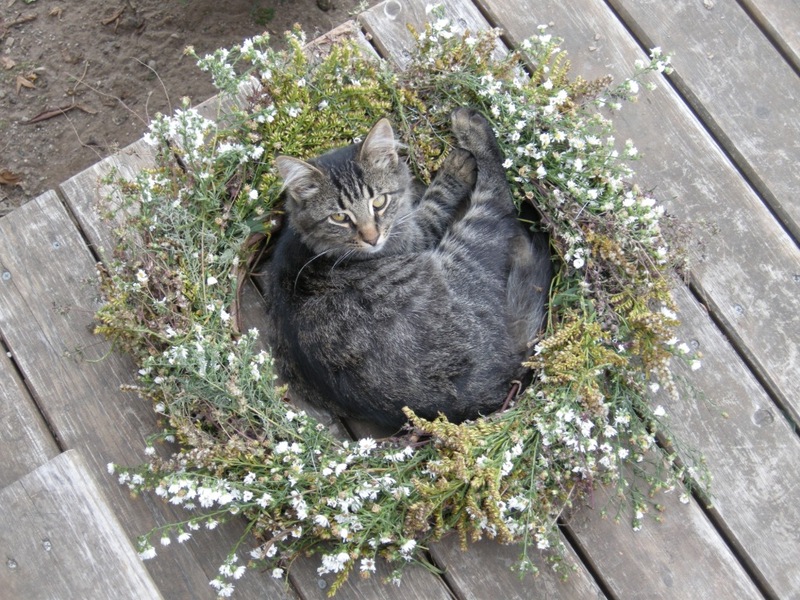 So today, you get a wreath photo tutorial. Total cost $3. It hides an ugly front door perfectly and kills a whole 30 minutes with children under 4. Watch the scissors, though. 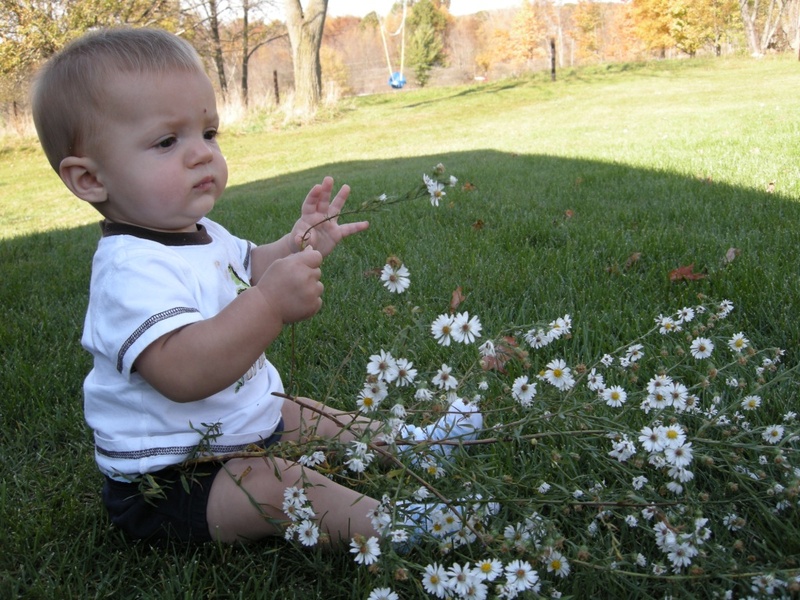 And the daisy ingestion. Just sayin’. Caption the last photo for me, would ya? I’ll pick my favorite one and the winner will get a winter hat or a knit market bag. Comments are now closed! Thank you! Mmmm hmmmm. See what happens when I’m hopped on NyQuil? I got’cher bloomers right here. Warning :: photo-heavy post ahead! Sorry, Trace! Alright. The bloomers. For now… I offer this mini-version, which will help those of you who are ok with sewing on the fly. Making it up as you go. Seeing pictures and running with it. If there’s interest, then I’ll sit down and draft out a real pattern with different sizes and such. Input is welcome here. Q :: Why did the motorcycle fall over? A :: Because it was two-tired!!! TOO TIRED. A MOTORCYCLE HAS TWO TIRES. Get it? I love it. There’s your shout-out, Pap. Introduction :: The gem of these capris is the leg hem. It’s very wide, which allows you to make a channel for elastic. It finishes your pants neatly, so the underside of your ruffle is easy on the eye. These are super simple pants… the body is straight if not baggy and the legs should hit just below the knee. 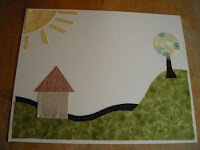 This is a great project for beginner sewers, as baggy clothes for kiddos leave a lot of room for error interpretation. Don’t be afraid! Materials :: 1/2 inch elastic for the waist, 1/4 inch elastic for the legs, 1/2 yard of fabric, thread, sewing machine, scissors, pattern or pants to copy, an hour or less of time… or, if you’re like me, 5 minute intervals of non-potty training peace and quiet. Process with Photos :: I’ll try to be as detailed and simple as possible. Let me know where I’m not, as this is the first sewing project I’ve attempted to explain. I also don’t have any spiffy software- no photoshop or anything 🙂 This is grass-roots simple, Baby. 1. Make you pattern on a paper bag by loosly tracing around a single leg on a pair of pants you already love. I used a pair of Ry’s capri’s, which are an Old Navy 24 months. ‘Loosly’ adds a seam allowance for you. I especially added on to the bottom and top for folding down and hemming. My pattern measures 7 inches across and 16 inches from top to bottom, but seriously. No need to be exact. 2. Fold your fabric, trace, and cut. Your fold should be along the straight, long side of the pattern. Repeat. You should now have 2 pieces. 3. With right-sides of your fabric (or sheet, in my case) together, sew the two outer ‘J’s (the yellow arrows). 4. Now, match up your two seams so that they are now front and center. It looks like a pair of pants, No? You just need to sew across the bottom, giving you the legs and crotch area. I hate the word crotch. 5. Working with you pants inside-out, fold down the top of the waistband 1/4 of an inch. Press. Now, do it again, but make it a whole inch this time. Press and then sew along the bottom edge, leaving a gap to slide your 1/2″ elastic in later. 6. [photo above] Same theory on the legs… but that second roll is going to be bigger. It makes your ruffle, so make sure you have about 2 inches from the top of the hem to the bottom of the pants. I added dotted lines to my pattern to help me know where I wanted the finished hem to be. I’m thinking these pants are super cute without elastic in the legs… look at those up there! Maybe for boys? In navy shirting fabric? JTP, get all over that. 7. Here’s a close-up of leg hem. You’re going to sew two lines in each leg: the first is at the very top of the hem… up the leg. Leave a small gap to insert you 1/4″ elastic later. The second line is a presser-foot’s width off the first one, or about 1/2″. The black line in the photo is showing you the gap for the elastic. Everything below becomes the under side of the ruffle. Remember, you’re working with the pants inside-out. 8. Insert your elastic in to the waist and legs. This is where you need to measure. I measure around Ry’s waist and then subtract a couple inches for the elastic. For the legs, you DON’T want this to be super tight. You want the legs to gather but not prevent them from riding up over the knee when your kiddo bends down. 9. Attach your elastic, making a complete circle. Close off your gaps if you like. Personally, I leave the waistband gap open so I can adjust the elastic as she grows. If she grows. This child will be 25 pounds forever. But I’m prepared, just in case. 10. That’s it, peeps. Seriously. It’s not hard. It’s harder to explain than do, and I hope I haven’t confused you… but they’re really simple. Send me pictures of what you come up with!!! I’d love to see it! Notes :: All seam allowances are 1/4″ unless otherwise noted. My sewing machine is an old, borrowed Kenmore. I do not have a serger, but if you’d like to buy me one I do accept donations. This tutorial is for personal and gift use only. If you’d like to make these to sell, please contact me about a hard-copy pattern. Gracias! In a fit of laundry-procrastination Saturday, I decided to move the whole TexasNorth blog from blogger to wordpress. I know, right?! Crazy. 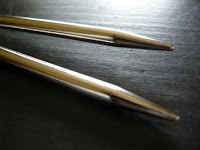 Here’s what I need you to do: change your bookmark or favorites or bloglines to: www.texasnorth.com That address will always bring you to me. Everything from the original blog has been moved here, but I’m still working out a few kinks. A couple videos and the last few comments never transferred over… so I’ll work on that. I know a bunch of you link to other sites from here, so I’ll bring all those links over, too. Why the change? It was needed to help with the future website design, I love the extra control over my comments, and it’s just cleaner over here. I hope you like it. Hi! How are ya? Shall we talk about tutus? Great. I’d love to. This weekend, Rylie attend her very first birthday party. It was required that all guests wear pink. I figured it was high time to find my crafting mojo again and head to Field’s Fabric. Extreme details: I bought 5 yards of pink and then a roll (pre-cut to 6 inches wide) of white and a roll of light green. The pink tutu cost $7.50 plus extra time for cutting and such. The green and white one cost $9.90 because the rolls are a bit more, but already cut for you. You also need some elastic- I used 1/2 inch elastic. I think 1″ would work lovely as well. Now, simply take a measurement around the waist, or use their pjs as a guide if your child is peacefully napping when your crafting mood strikes. Sew the ends together… or knot them, or glue them, or safety pin them. Whatever floats your boat. Tutus are made of tulle and will not last forever. They will be worn as veils and hats and scarves and then pulled to within an inch of their elastic as a cage for a wild beast and then stomped on and thrown in the costume box. Don’t knock yourself out. Take your tulle. If it’s on the 6″ roll, fabulous. If it’s still in a big sheet, cut it down to long strips of 6″ wide pieces. Now cut those 6″ wide strips into ribbons twice as long as the length you’d like. The pink tutu was cut to 24″ (so, it hangs 12″ inches from the waist). The green tutu has pieces that are 30″ long. Now. You should have a stack of tulle about 6″ wide and maybe 25″ long. You should have a waistband of elastic. Grab yourself a Coke and have a sitdown in front of the Gilmore Girls. Slide the elastic up onto your leg- just over you knee. Take one ribbon of tulle, slide it under the elastic, and tie a square or double knot to secure it to the elastic. Slide that knot to the side, grab another ribbon of tulle, and repeat until all your pieces are gone. It doesn’t matter how you make your knots… just make them the same way every time. It’ll look fabulous, I promise. And there you have it. Just a bunch of knots, Folks. These are all over the web, all over craft fairs, all over everywhere. It’s not a new idea. But, it IS a quick and satisfying project for an hour. Have fun 🙂 And, of course I’ll make you one if you just can’t handle the tulle. I’d be happy to. Just yell. See you Thursday. Right here. Because this is where I live now. Oh my word, it’s Thursday. I swear, this baby in me is sucking the common sense life out of me. I’m losing my mind. My MIND, People. It will not let me sleep. It will not let me eat. It will not let me watch bad tv. But thank you so much for your excitement and your cheering and your carrying-on. From the bottom of my Texas Heart, thank you. I forget- every time, I forget– that I am living on borrowed time. I am spending borrowed money. I am raising a borrowed child and tending to borrowed land. It is not mine. They are all graciously given to me through no accomplishment of my own. In fact, if I were personally audited, I’d be given a one-way ticket to The Bad Lands… cause: Not Living Up to Fullest Potential and also BEING A WHINER. So, no audits. I take what I get. By grace, by Grace, I am blessed. I am pregnant. And, I am joyful. I am scared and sick and thrilled… but I am joyful. I wonder what Child He is sending my way this time? Please let it be healthy and safe. And also, please let Curt let me name it Tess. And please don’t let it be a Little Curt. We none of us are ready for that. All materials can also be found with a quick trip to your local Michaels or Hobby Lobby. 1. 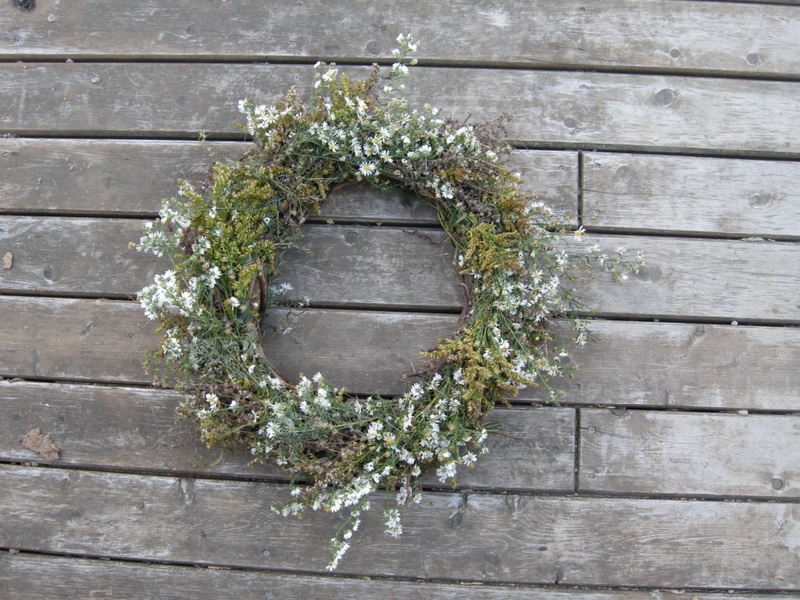 Grab your old wreath off the front door. Curse yourself for the shabby shape it’s in. 2. 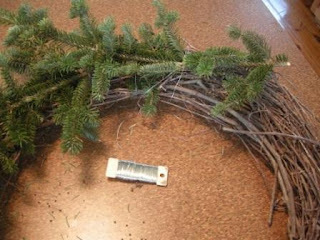 Trim your evergreen boughs until you have a nice stack to choose from. Grab your wire. Note: I used silver because it was on-hand, but there’s also green which would blend in better. 3. 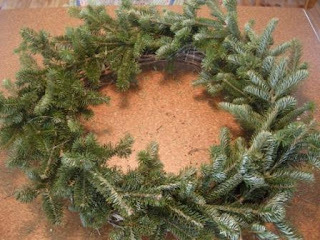 Begin by laying one or two evergreen pieces down on the wreath with the stems sticking to your right. 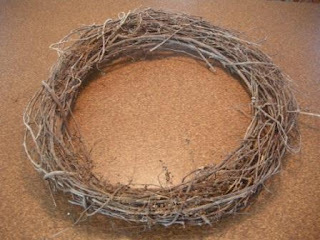 Grab your spool of wire and wrap around entire piece… wreath and boughs together. Continuing to your right, lay more boughs over the previous stems wrapping the wire as you go. The wire, from the front, will disappear into the branches. No worries. 4. 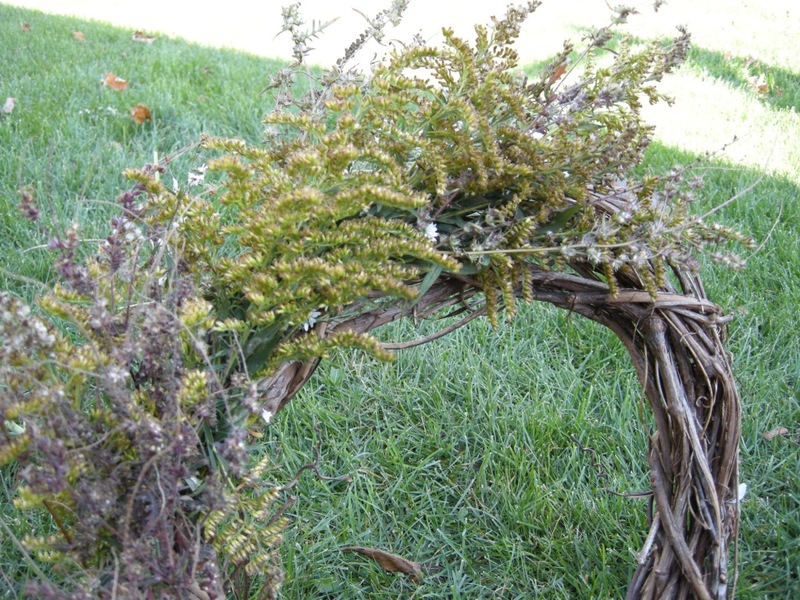 Continue all the way around your wreath until it’s as full as you’d like. Maybe add some holly berries to brighten it up a bit. That’s it, Folks! Oldest trick in the book. Love to you all… have a fabulous weekend. There are 42 million reasons why I love all of you, why I read about all of you, why I incessantly talk about all of you to people who do not know you. Most of those reasons are found in last Thursday’s comments. You absolutely rock my world. Folks, a little crafting for you today. My little arthritic fingers have been busy over here… staying up late, watching Law and Order, buzzing away on some custom orders and new ideas. May I share? In the middle of my insanity last week, I popped in City Knitting and bought two pair of circular knitting needles. But, not just any needles. Addi Turbo needles. Sometimes… ok, all the time… good tools make all the difference, right Jim? I’ve been working on a canvas for a sweet lady in North Carolina, whose accent is simply charming. These canvases are 16×20 and flat, so they fit in picture frames nicely. 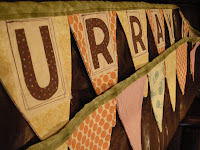 Each scene is hand-cut from my fabric stash (Do those patterns look familiar, Sunday?). I fill in the ‘sky’ area with quotes and Scripture and messages from friends and family. I have really fun art pens for that part. (Miss Chris, I know you’d appreciate them.) This is the third canvas I’ve made. It’s the closest I come to drawing and designing free-hand, and I love that. Celebration banners! These are prolly my favorite thing to make, though they are the most labor intensive. I love picking out the flag fabrics, cutting out their names, making the tape, thinking of the party when it will hang above a happy kiddo. I still have 4 of these to go, with a self-imposed deadline of August 1st. 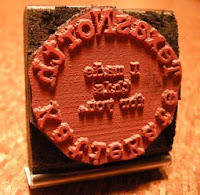 And, I made a stamp! Why not? I’ve been working on a logo for awhile now, and finally came up with something I love. It says ‘TexasNorth KatieKate’ around the outside and ‘I made this for you.’ on the inside. I wanted it to look like an old passport stamp… typewriter font and round. This stamp will be used on packages, on cards, and on fabric as a label. You can make anything these days! Thank you, Microsoft Publisher. 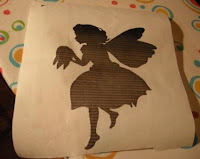 And finally, a project for you: Freezer Paper Stenciling! Now, this has been around, um, forever… but I know some of you are new to the craft world, so I’ll put my version out there. It’s the easiest craft I know of. For a girl like me, who never got to Bedazzle anything, it’s heaven. 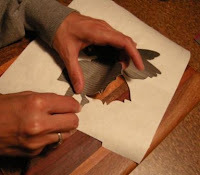 You need: a razor blade, a cutting board, freezer paper (found right next to the aluminum foil in grocery store), some fabric paint, a little paintbrush or sponge, and your computer. Now, transfer that photo or clip art to a Word document and adjust the size to whatever you’d like. Take that freezer paper and trim off a piece that’s 8.5 x 11 inches so it fits in your printer just like a regular sheet of paper. Ideally I like to print on the non-waxy side to avoid smudging, but I can never remember which way to put the paper in. Details, you know. Magic! You have your letters or your picture on your freezer paper and now you need to cut it out. Warning: this part is highly addictive. Grab your cutting board and cut out the figure carefully. This little lady was altered to hold a heart instead of a tooth. You’re going to take your cut-out and lay in on the fabric, waxy-side down. 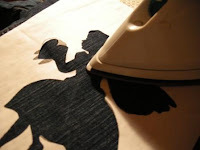 Press the paper with your medium-hot iron onto your fabric. This temporarily adheres the freezer paper to you fabric and gives you nice, crisp lines for painting. It’s genius, really. 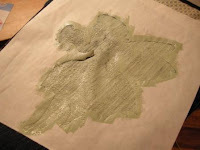 Sponge your paint on, let it dry, and then rip off the freezer paper. Love. It. 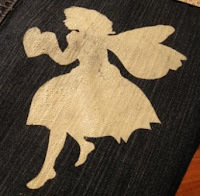 This is a great project with kids (as long as mom cuts the picture out), or for baby presents, or on bags that need a little sprucing up, or on t-shirts… the possibilities are endless. Jami says if you run an iron over the finished product, your design will last forever. I never doubt Jami. To recap: print, cut, press, and paint. It’s that easy. I firmly believe I can finish the laundry today. I shall go. Love to you all… and happy creating!